We count ourselves lucky to have fabulous partners like the World Luxury Hotel and Spa Awards. They give us the scoop on some of the best spots to indulge in around the world. When we asked for suggestions on award-winning spas in Dubai, Guerlain Spa at One&Only The Palm was at the top of the list. First off, we just have to say that the hotel itself will blow you away. With hotels being thrown up fast and furious these days, there are many being branded as 5-star. But take a closer look and you can tell when they’re just a quick-fix only trying to be 5-star. There just isn’t as much thought or care put into them. Then, of course, there’s the One&Only brand which is one of the few hotel brands that always blows us away with a gasp. They never need to shout, scream, offer ladies nights, or flashy brunch packages to lure you in. 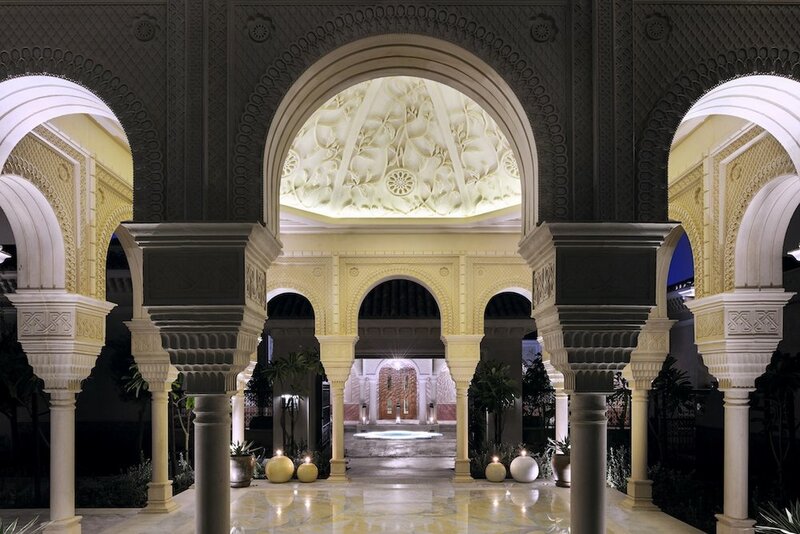 The brand is a quiet enigma and while we can’t yet comment firsthand on the hotel experience, we can say with absolute certainty that the Guerlain Spa at One&Only The Palm is a blissful sanctuary. Pra arrived here seething, having come straight from a rather stressful boardroom meeting, but my mood dissipated within minutes. As soon as you enter One&Only The Palm, you are 100% in your own bubble. It’s one of the only hotels where I’ve seriously mulled over whether it’s more beautiful in the daytime or at night when it glows with candles and dim lighting. The spa is located past a beautifully tiled pool that is lit up at night. You won’t be stuck in the basement where other hotels choose to place their spas, as though a mere afterthought. No, One&Only truly appreciates the spa as a business in its own right and it shows. The Guerlain Spa lounge/reception area will make you sigh in deep appreciation. It’s spacious but has an amazingly cosy feeling, especially during the evening hours I was there. I had a chance to meet the ladies and the spa manager, who gave a beautiful description of my treatment for the evening. Everything was very relaxed but don’t mistake that for laidback service. The staff here are on top of it and you are well taken care of from start to finish. They excel at making you feel welcome and unrushed - the time you spend at the spa is yours and no one else’s. That feeling alone is like gold for those of us who spend our days running from meeting to meeting, answering urgent emails, and frantically pulling together reports before deadlines. Guerlain Spa have outdone themselves in terms of design and layout. I was led down a beautiful candlelit corridor to my treatment room which was practically the size of my apartment! My jaw dropped and my eyes went wide - I must have looked like a child in a sweet shop! In fact, I think it’s actually referred to as a treatment suite because it’s not just a room with a small changing area and a massage table. The entranceway led into a cream-coloured living room space, complete with candles, soothing piano music, and a sofa topped with eight plump pillows. I continued on through a set of sliding doors which opened up to the most gigantic bathroom area. Here, I promptly changed into a fluffy dressing gown and slipped my feet into a pair of soft slippers. I gave myself a few minutes to take in the details of everything around me. In the bathroom of the suite I was being treated to, there were two bathtubs, one in each corner, to accommodate couples looking to indulge in the treatment together. Throughout the suite, I could see that no corners had been cut. Accent walls are tiled in an oversized botanical design and the high ceilings really open up the space. From the wooden doors, to the delicate vases, to the soft cushions - everything is of fab quality. Truly One&Only style! There were also some great amenities, though, as someone coming straight from work, I would have loved to have seen a bag of goodies with items like eye makeup remover, facial cleanser, cream, and maybe even a bit of tinted moisturiser so we can walk out looking half decent at the end of the treatment. But really, other than that, I couldn’t have asked for more. After I had changed, I headed back out to the living room area where my therapist was patiently waiting for me. She once again took me through the treatment in detail, letting me know what we were doing and what to expect. Before anything, though, I jumped into a beautiful bubble bath that had already been drawn in the bathroom. My therapist brought in some tea and then I just zoned out for a good 10-15 minutes of uninterrupted bliss. It was the perfect way to ease myself into the spa mindset. From here, the treatment began. The Désert d’Orient is a 2-2.5 hour journey of utter bliss. First up was the Silk Indulgence Milk Scrub, followed by a Guerlain body wrap which took place in a hammam area next to the bathroom. Most of my experiences in hammams have left me wincing from over-scrubbing but this was far more relaxing and much more up Pra’s alley. It didn’t leave me silently begging for a massage afterwards, nor were there too many interruptions of getting up, lying down, turning over this way and that. I then headed into the steam room with the wrap which, according to the spa, purifies the skin, eliminates toxins, and soothes muscle pain. More often then not, I’m usually eager to get out of the steam room, probably due to an episode of “Tales From The Unexpected” years ago where someone got locked in one and died! But this room had just the right amount of steam and I comfortably sat in there, letting the wrap work its magic. The massage left me in a puddle of bliss and was the perfect end to the treatment. My therapist used a Guerlain Massage Elixir that she rubbed into my skin using a brilliant method, leaving my body soft and completely unwound. I have to say, my therapist Diki Bhutia was phenomenal and super professional from start to finish, making her a very good asset to the spa. From technique to just being a fabulous hostess, she really made the Guerlain Spa experience top notch. Meet Maria Marques, the lovely Spa Manager of Guerlain Spa. Originally from the Canary Islands, Maria has been in the spa industry since 2001 when she opened the first big spa in the Islands - a massive 2000 m2 Thermal Circuit. She joined the One&Only group in 2008, working with big industry names like Givenchy, Carita, Comfort Zone, Thalgo, and ESPA, before making her way to the Guerlain Spa at One&Only The Palm in 2016. What inspired you to join the One&Only team? The award-winning One&Only Resorts offers awe-inspiring luxury with world-class facilities and amenities. Immediately I could foresee a world of incredible experience to incorporate to my background. In your eyes, what makes Guerlain Spa at OTP stand out from the rest in such a heavily saturated market? One&Only The Palm Hotel is considered as one of the best in the region, not only for its beautiful setting but also for its impeccable service. It plays the perfect partner for the luxury brand’s first spa in the city - Guerlain Spa - where we feature one-of-a-kind treatments in an exceptional setting celebrated for its tranquility, privacy, refinement, and beautiful style of architecture. Guerlain and One&Only The Palm have created unique exclusive therapies only available at One&Only The Palm, among which I wish to highlight the Hammam-inspired Ritual “Desert D’Orient”. This is our signature treatment created by Guerlain following the true oriental traditions. With regards to Guerlain Signature Treatments, Orchidée Impériale Prestige & Ultimate treatments and Abeille Royal Expert treatment, are the quintessence of our most advanced experiences. The remarkable power of longevity of the orchid has inspired the exceptional Orchidée Impériale treatments. In our Abeille Royale wrinkle correction & firming treatments, all begin with the extraordinary properties of honey and royal jelly. In research going back ten years, Guerlain has scientifically proven the effectiveness of bee products in boosting the skin's repair mechanisms. What do you look for in the therapists who join your team? To provide physical and emotional relief is only in the hands of very special people. Your favorite spa in the world? Together with ESPA, One&Only has created a luxurious island spa retreat, where tension dissolves with the gentle ebb and flow of the ocean as the cares of the world outside quietly drift away, succumbing to the expert care of therapists trained in ancient healing philosophies and modern-day sciences. Luxurious treatment villas, nestled beneath thatched roofs, each with spectacular ocean views, provide a perfect tranquil space for an individualized, holistic wellness journey. The COMO Shambhala Retreat at the COMO Shambhala Estate near Ubud (Bali) provides a completely immersive, 360-degree wellbeing experience. Besides spa classics such as massages, guests can also opt for a traditional cleansing ceremony, and a range of water-based therapies, which use water from the estate’s spring, with a view on the rainforest canopy. It doesn’t get any better than this. There are also various facials and massages, as well as treatments specifically for men. For travellers, they have treatments for jet lag and pre-flight, created specifically to help soothe the effects of air travel. You can indulge in some retail therapy by picking up a selection of Guerlain products from the spa’s boutique. First of all, don’t make the mistake I did and schedule something after your treatment. I unfortunately had to rush off but completely regretted it. Had I had the time, I would have made the most of that sofa with those cushions! You’re going to be completely blissed out so just give yourself time to soak up the tranquil vibe in the spa’s lounge area. Now, this is more of a mental note for ourselves, but we have put a stay at One&Only The Palm on our must-research list. If our spa experience is any indication, spending a night or two at this fabulous hotel, especially post-treatment, would probably be the ultimate #CaviarMoment.